Suicide is a wicked problem because it kills and injures millions of people each year, it is a complex behavior with many contributing factors, and it can be difficult to prevent. 1.1 One million people die by suicide each year An estimated one million people died by suicide in 2000; over 100,000 of those who died were adolescents (World Health Organization, 2009). If current trends continue, over 1.5 million people are expected to die by suicide in the year 2020 (Bertolote & Fleischmann, 2002). The world wide suicide rate is estimated to be 16 deaths per 100,000 people per year (World Health Organization, 2009). The ratio of suicide attempts to deaths can vary depending upon age. For adolescents, there can be as many as 200 attempts for every suicide death, but for seniors there may be as few as 4 attempts for every suicide death (Berman, Jobes, & Silverman, 2006; Goldsmith, Pellmar, Kleinman, & Bunney, 2002). A recent household survey conducted in the United States estimated that 8.3 million adults had serious thoughts about suicide in the past year, that 2.3 million had made a suicide plan, and 1.1 million had attempted suicide (Substance Abuse and Mental Health Services Administration Office of Applied Studies, 2009). A survey of Australian adults conducted by the World Health Organization found that 4.2% of respondents had attempted suicide at least once during their lifetime (De Leo, Cerin, Spathonis, & Burgis, 2005). Suicide is a particularly awful way to die: the mental suffering leading up to it is usually prolonged, intense, and unpalliated. There is no morphine equivalent to ease the acute pain, and death not uncommonly is violent and grisly. The suffering of the suicidal is private and inexpressible, leaving family members, friends, and colleagues to deal with an almost unfathomable kind of loss, as well as guilt. Suicide carries in its aftermath a level of confusion and devastation that is, for the most part, beyond description (Jamison, 1999, p. 24). Here is NASP Position Statement on the Netflix series “13 Reasons Why”. I think that it is important to be careful with the information and discussions we have around suicide. This position statement is worth reading. 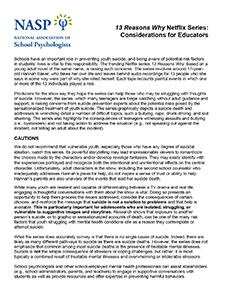 Students who feel suicidal are not likely to seek help directly; however, parents, school personnel, and peers can recognize the warning signs and take immediate action to keep the youth safe. When a student gives signs that they may be considering suicide, take the following actions. MYTH: Talking about suicide will make someone want to commit suicide who has never thought about it before. FACT: There is no evidence to suggest that talking about suicide plants the idea. Talking with your friend about how they feel and letting them know that you care about them is important. This is the first step in getting your friend help. Work with other students and the adults in the school if you want to develop a memorial for someone who has committed suicide. Although decorating a student’s locker, creating a memorial social media page, or other similar activities are quick ways to remember the student who has died, they may influence others to imitate or have thoughts of wanting to die as well. It is recommended that schools develop memorial activities that encourage hope and promote positive outcomes for others (e.g., suicide prevention programs). Brock, S. E., Nickerson, A. B., Louvar Reeves, M. A., Conolly, S., Jimerson, S., Pesce, R, & Lazarro, B. (2016). School crisis prevention and intervention: The PREPaRE model (2nd ed.). Bethesda, MD: National Association of School Psychologists. Suicide is a major public health concern. Over 41,000 people die by suicide each year in the United States. More than twice as many people die by suicide each year than by homicide . Suicide is tragic. But it is often preventable. Knowing the risk factors for suicide and who is at risk can help reduce the suicide rate. It’s a question asked by parents, educators and health professionals. How do we prevent suicide among our children? In this special podcast series devoted to Children’s Mental Health Awareness Day, Dr. Jane Pearson of the National Institute of Mental Health talks about important warning signs that come from children. She also looks at how well-intended reaction to tragedy can have unintended consequences. Dr. Pearson is with the Division of Services and Intervention Research at NIMH and a leading expert on suicide research. Joanne Harpel, Margo Requarth, and Nancy Rappaport. (c) AFSP Survivor Initiatives Department, 2014. PowerPoint on Suicide– Take time to go through this is a great resource.